A lot of people, if not most, would think anarchists are against rules, police, the state, organisation of society, etc. Anarchists are against aspects of all of the aforementioned, this is true, but we are against hierarchy and power being centralized in the hands of a minority in society. The rules and laws that we are against are those that oppress and exploit others; we are against the police because the police are a tool that are used by the ruling elite to keep their power over the rest of society, and it’s the same for armies and prison warders. The old saying that “power corrupts” is very true, you can see this especially with police, prison wardens, soldiers, and all types of state officials, bureaucrats, managers, bosses, and so on. Once a person puts on a uniform or is given some type of position of power they start a process of transformation to becoming a tyrant. We anarchists are against the way the current society in which we live is organized. It's organized in a statist, hierarchical, way - a tiny minority sits on top of society, more or less telling the majority of people what to do and how to live. The corrupt and villainous elite use brute power and threats to keep their privileges and riches. Their weapons are the state - with its arsenal of oppressive laws, government, police force, prisons, and military - the media, and banks. These are all used to corral the people like cows or sheep. The government is the biggest sham of all. This gives people the illusion (but not that much of an illusion) that we live in a democratic and just society. But all governments and government elections are the right of the people to vote for and elect different sections of the ruling class to exploit and oppress us every few years. A blatant example of this is the government using the people’s money that is meant to be spent on medical care and hospitals, housing, education, etc, being used to bail out the banks and all the corrupt, slimy, business people, companies and corporations that have enriched themselves off the backs of the workers and the people - who got off scott free for helping create the recession that is having such a damaging effect on people. The state and government has blatant contempt for society. There are laws against theft. If a person gets caught shoplifting, they will either get a fine, suspended sentence, get a few hundred hours community service or a 6 month prison sentence. If a person gets caught holding up a bank and robs 5,000 euro, or if the person is really lucky and manages to rob 100,000 euro, they will get 10 years in jail. Now let’s look at a bank official that robs millions and gets caught. How long do you think they’ll get in jail? The answer is they won’t spend a single day. Are these laws in the society we live fair or right? Who benefits more? Why isn’t there a law against homelessness, a law against inequality, or a law against being poor? Yes we anarchists are against the state and everything it stands for. Anarchists want to smash the state and get rid of it. Anarchist want to do this because in order to transform and create a better society for all the state needs to be removed. But we don’t want to smash or get rid of the good aspects of this society. Aspects such as public transport, social welfare, jobs, shops or any publicly owned services that are controlled by the state, or even privately owned service that provide people with a better life. These things were organised to serve the interests of capitalism (for the rich to profit off) but they also serve needs of the people. These services play a dual role, capitalists profit from them and they also pacify people. Anarchists want to get rid of the bloodthirsty, money hungry, leeches that control and profit from these instruments. We want to see this property taken from them so as to be reorganised by the people and used to make everyone’s life better, so the people can reap the full rewards from these resources. These instruments and resources could be used in way that could benefit everyone. These things which people depend upon to live are used by the powerful and corrupt elites as a means to oppress and exploit society, therefore these resources have to be taken from them. When anarchists talk about smashing and over-throwing the state we do not intend to replace the state with a society of chaos with no organisation; no, we want organization, the workers and all the oppressed and exploited people organized to take power themselves and for them to organize society in the best way possible that can benefit everyone and meet their full needs. It is a delusion that a few laws can be passed by a government to create a better, more equal, society for us all. This does not mean that it is impossible to create a new and better society. No, the answer lies in the hands of the people themselves. Only the people know what they need, no political party can predetermine what the people need and want. Political parties and governments always go back on their promise that they make before getting elected. They cannot be trusted; the people will not betray themselves. A government cannot reorganise society for the better. For one thing, we’ll be waiting a long time before we see a government (no matter how left-oriented they may be) expropriate from the corrupt criminal elite what they stole from the people. Look at the Syriza party in Greece, where has their rhetoric got the people of Greece? Look at Hugo Chavez' party and their “Bolivarian revolution in Venezuela”? Hugo Chavez proclaimed it socialism of the 21st century. Although there have been some positives to Hugo Chavez' reforms in Venezuela, it’s a far cry from socialism. Anarchists are not against socialism; we are supporters of socialism and want it created throughout the world. But the socialism we want is democratic and without hierarchy, wiith the people in power and not some “vanguard party”. The path of reformism pacifies revolutionary movements and struggles. Movements get caught up in chasing people for votes and as a result they constantly have to water down their politics. Funding, a lot of time and effort, will be put more and more into getting members elected. Eventually what was the revolutionary movement will be transformed into a reformist party little better than the most conservative party. Socialists in parliament, no matter how radical their rhetoric and their speeches may be, cannot influence a thing. The nature of the governmental system will slowly break their rhetoric down, watering down their socialism bit by bit. Eventually the socialist politician will fall into line with the system. They discover they can’t bring in socialism. They see how corrupt parliament is, and the shady deals made in pursuit of power. They gradually come to the conclusion that socialism cannot be created. They won’t admit it because they still want their career in politics. They then, at best, turn into liberals, believing socialism can never be achieved because they cannot implement it by using the system to do so. Why would the system allow itself to be destroyed and transformed into socialism? The answer is simple, it wouldn’t. The only way to change the system for the better is to destroy it, overthrow it, and create a new one. The parliament is the protector of the system, it is not an instrument to help people, it is an instrument of the ruling elite to keep the people in place. When socialists want to be elected into parliament and are canvassing for votes - giving people false hope that the parliament can make their lives better - it helps the people to keep believing that parliaments and governments can improve and change their lives for the better. And therefore keeps the ruling elites on top of society, ruling over everyone. Socialist politicians preach “vote for us, we will change things”. These politicians think revolution is when socialist politicians have gained a majority in government. Again and again we have seen this fail. In Ireland the Labour Party was established in 1912 by revolutionary socialists James Connolly and Jim Larkin to fight for the right of the workers and to fight for a socialist society. They went from being a revolutionary party to a liberal reformist party sharing government with blue shirt Fine Gael. What would Connolly and Larkin think of them now? Then we also have the history of Official Sinn Fein later to be renamed the Workers Party. This party preached socialist rhetoric, but their downfall was in parliamentarianism. Like most parties in the 20th century which called themselves Marxist-Leninist, they stuck to trying to win votes in the attempt to gain majority in parliament. They changed from the road of revolution to the path of reform. Eventually the Workers Party fell apart and their TD’s such as Pat Rabbitte, Eamon Gilmore, etc, went on to join the Labour Party. These same TD’s that once professed socialism, went from fighting against harsh state taxes when in the Workers Party to fighting to implement harsh taxes and austerity measures on the people when in the Labour Party sharing government. These self-described socialists in the Labour Party, along with Fine Gael are leading the implementation of the EU’s and IMF’s neo-liberal policies. They are selling the people’s property and wealth to corporations and big business. 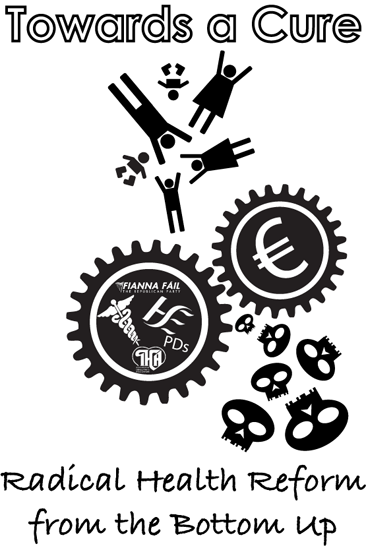 The social impact of neo-liberalism in Ireland is massive and growing, we have still yet to see the full effects from it. We have high unemployment, state-owned companies which employ thousands sold off, mass emigration, and a homeless and housing crisis with tens of thousands in need of housing; massive cuts to different branches of health care, education, and many other social programs that help communities and people. We have massive suicide rates, a rising number of people suffering with mental health problems, a rise in substance abuse and addiction. Nothing has ever been seen like this in the history of the free-state. These massive cuts and selling of state owned businesses and companies is to create money to pay back EU banks the debts that the criminal elites owe. The state does not actually own these businesses and companies, the people own them. Then why is the government selling them? The government doesn’t want to lose face with the EU and IMF. So the government is forcing the people to pay through methods of extortion and blackmail, to help further enrich greedy corporations, EU banks, and the IMF. These are the same politicians that professed socialism during the 70’s, 80’s, and 90’s. So will we see the latest batch of socialist politicians flip flop in the future? In another few years it is very likely that the parliamentary parties that now proclaim socialism will do the same. They have already started this process. Their politics are watered down. Why do they use front names like People before Profit or Anti Austerity Alliance? Why don’t they use their real names? Why do they feel they need to try deceive the people they want votes from? For example, recently at a protest in Dublin there was a called for civil disobedience by a certain socialist politician. This same politician a few months previously condemned a person that threw a brick at a Garda van. This shows how opportunistic parliamentary politics is. Politicians are constantly jumping from one position to another in so that they may get a few extra votes. Socialism cannot be implemented through by legislation or laws. The last century of workers' struggles proves this. The parliamentary socialists are actually strengthening this oppressive and exploitative system, by giving people false hope that parliaments can be used for good. But history has shown what lies in parliament: compromise.